The Good Beer Guide 2006 provides full details on the best 4,500 pubs in the UK serving real ale. It is an indispensable companion wherever you are in the UK, as it provides full details on the best pubs in Britain's towns, cities and countryside and how to find them. 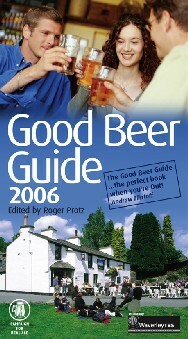 The Good Beer Guide 2006 is published by CAMRA and is available in all good bookshops and direct from CAMRA. The full price is £13.99; the CAMRA members' price is £11. See CAMRA for further details. These pubs were voted by CAMRA members as being worthy of inclusion. This includes corrections to errors introduced during the editing of the Guide and any major updates.